A New Secret Of Captain Kirk's Origins? 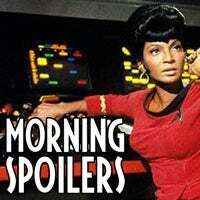 The most spoilery spoilers this morning have to do with the past, not the future - like, we've learned a secret about Captain Kirk's beginnings that could change everything. (Yes, even your lunch plans!) Also, we've seen a new Clone Wars trailer and a new Fringe video that made us oddly excited about both of those properties. Seth Rogen and Samuel L. Jackson explained their movies Green Hornet and The Spirit — and you'll never guess which one of them will look like George Clinton. And new photos from Life On Mars, Knowing, Heroes, The Middleman and Stargate Atlantis give away the goods big time. The goods, I tell you. Also, there are new tidbits about Sarah Connor and Knight Rider. Yay for omnitemporal spoilers! Here's a new Clone Wars trailer, which shows a lot more of dark Jedi assassin Asajj Ventress and her master, Count Dooku. (And it's nice to hear Christopher Lee's voice again, honestly.) I got just a tinge of the old Star Wars goosebumps watching this, something that hasn't happened with most of the Clone promos so far. Oh, and here's an NBC Fall TV promo which includes people from Heroes and Chuck. Additional reporting by Lauren Davis.